Career Services at UW-Madison are organized and delivered by schools and provide comprehensive career services including career advising and workshops, job postings, career fairs, on-campus interviews, and more. Contact your academic department for other specific career resources. Looking for a short-term or part-time position? Visit the Student Job Center. Connect to established UW alumni for professional advice, support, and opportunities. Check the box to choose if your profile will be set to public or private. We recommend keeping it set to private until you fill out your profile and/or check in with a career center advisor. Fill out the interest survey and start exploring! 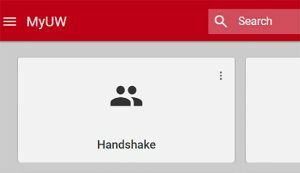 Some of your information can be updated right from your Handshake profile, and some has to be updated in the university student information system. If any of the above is inaccurate, please work with your academic advisor or the Registrar’s Office to have this information corrected. This information is updated weekly, so if something looks off check again the following week! Why aren’t my updates showing up? Information pulled in from university student information system is updated weekly, so if something looks off check again the following week! How do I hide my GPA? Open your UW-Madison Education section and select “Hide from employers” on the GPA you would like hidden. How do I make my profile public to employers? Why Should I Make My Profile Public? How to register for a career event (fair, workshop, info session) or sign up for an interview? Go to the Events tab in your Handshake profile. From there select the event you are interested in and select “Register.” Make sure to read over the event details to see if there is any additional information you should be aware of to prepare for your upcoming event!